Bushnell 137500 Marine 7x50 Waterproof Binoculars with Compass 137500 FREE SHIPPING! Bushnell's Marine 7x50 binoculars are built for maximum survivability and functionality in nautical environments. Their O-ring seals and nitrogen gas fill make them completely waterproof even when submerged, and the durable body is designed to resist saltwater corrosion. Its durable rubber armor provides a secure non-slip grip even in wet hands, and also protects the optics from impacts. The binoculars feature premium BaK-4 Porro prisms and multi-coated optics, maximizing light transmission to produce a bright, clear image. This model also places a ranging reticle and illuminated compass inside the field of view to aid with rangefinding and navigation. 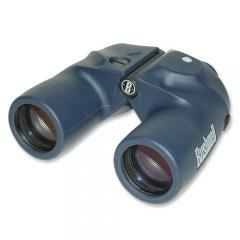 ©2002-2019 CopsPlus.com: Bushnell 137500 Marine 7x50 Waterproof Binoculars with Compass 137500 FREE SHIPPING!